The fleece coat is a blend of curly wool texture and flowing waves and light swirls. The fleece coat varies from curly to wavy or a blend of the two. Initially maintenance is on the medium to low side. You will want to do a “stripping” at least once a month. This entails a brushing and combing of the entire dog to remove all of the dead coat. The curly coat should be brushed thoroughly once a week and trimmed two or three times a year, cut to the length you prefer. The wavy coat will not require cutting except to allow for proper vision, but may have slight shedding and should be groomed once a week. 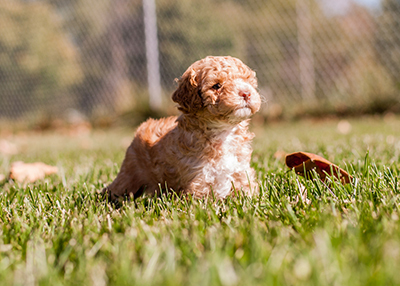 The adult coat of all types tends to be a bit curlier than the puppy coat which will “transition” at approximately 8 to 10 months of age. It is best to trim the coat at this point as the transition period will mat easily. Tools for the grooming of the fleece coated Labradoodle should include a quality scissors, a slicker brush, a comb, as well as a nail clipper for a regular trim of the nails. To prevent ear problems, the hair under the ear (where the ear lays on the cheek) should be kept cut very short to allow for air circulation to the ears. If hair is heavy in the ear canal, it may be necessary to pluck the hairs out. Once a month the ears should be cleaned with Canine Ear Wash Solution (see formula on attached sheet) or weekly with a good ear cleaner. Wipe the ear canal dry with a cotton ball on the end of your finger. Don’t wait until problems occur to care for your dog’s ears! Keep between the toes and on the bottom the feet trimmed to avoid problems. Regular daily brushing is recommended, along with professional grooming at approximately six to eight week intervals. Grooming should include the hair on the leg trimmed to reach just above the floor and not allowing the trimmed toes to be exposed. (Don’t trim the legs short in a poodle cut, but let the leg coat fall back over the trimmed feet.) If a short clip is desired, we recommend ¾” on the body and 1” on the head and legs.